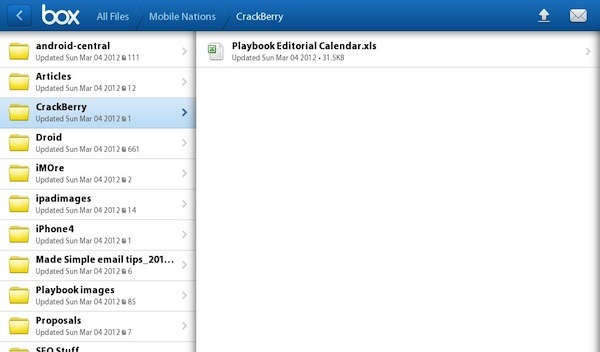 We know that we need more native apps for our beloved PlayBooks. We also know (even more so after BlackBerry World 2012) the BlackBerrys are for people who need to get stuff done. In today's world - no matter what business you are in - getting stuff done means having access to cloud storage. For some platforms, there is an app for everything - including cloud storage. Our sister site (iMore) ran a great article on all the available apps for cloud storage on iOS, and it is worth a read. For us PlayBook owners, we need to get a bit more creative. The good news, however, is that we can access all major cloud storage services on our PlayBook as easily and as effectively as any other platform...we just need to work a bit harder at it! Dropbox is pretty much the king of cloud storage these days. If offers a paltry 2GB of storage for free but it gives you incentive to invite others and collaborate with colleagues. When you get people to sign up using your personal affiliate link- you get extra space. 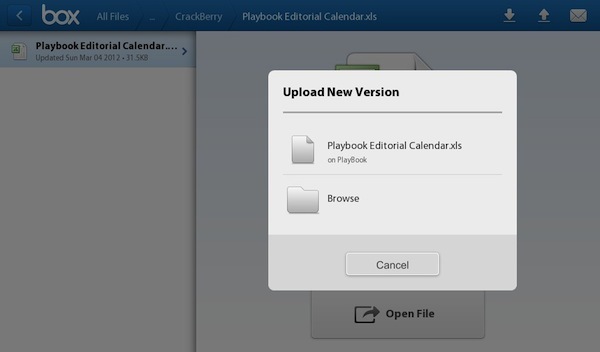 Unfortunately, there is no native Dropbox app that is produced for the PlayBook at this time. Fortunately, we have BlueBox - a free app that syncs with your Dropbox account. First, set up your Dropbox account on your Mac or PC and upload those files you wish to sync between your Dropbox devices. Next, download the BlueBox app from BlackBerry App World and you are set to go. Using Bluebox is very easy; just log into your Dropbox account with your email and password. You will then see all your files and folders right on the PlayBook. Scroll through your Dropbox files and touch to highlight the document with which you wish to work. You then have the options to Copy, Cut, Rename, Delete, Download, Zip as or Download and Launch. When you select Download and Launch, the appropriate app loads up on the PlayBook. This makes it very easy to quickly open and work with all Office documents and PDF files. Now, one area where BlueBox falls a little short is that if you open a document and make changes, those changes are not automatically synced to your Dropbox account. When you first opened the document it saved a local copy to the PlayBook. So, in BlueBox, just select Upload file, then find the file on the PlayBook to upload. It will then show up in your documents directory. 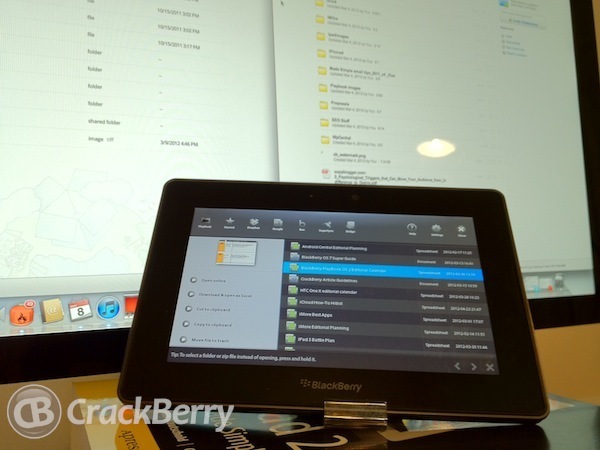 BlueBox for BlackBerry PlayBook is free and can be found here. Files and Folders is (just as the name suggests) a file navigation app for the PlayBook. One of the real benefits of this particular app is that it has built in support for most major cloud storage services. Download the Files and Folders app from BlackBerry App World and start up the app. For our purposes, we need to set up Files and Folders to work with our Dropbox account. Just swipe down from the top to bring up the options and settings for the app and select the Dropbox icon. Login to your Dropbox account and you will see all your files and folders. 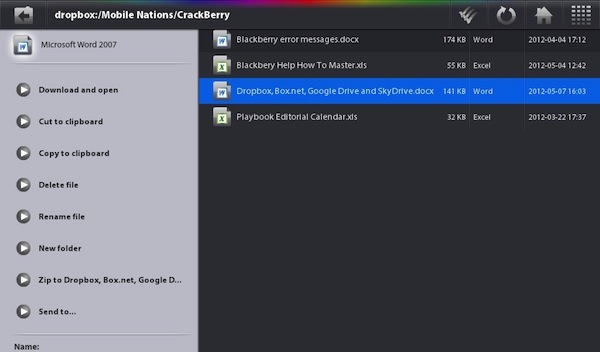 Navigate to the file you wish to open on the PlayBook and you will see options along the left hand column: Download and open, Cut to clipboard, Copy to clipboard, Delete file, Rename file, New folder, Zip to Dropbox, Box.net, Google Docs, Send to. Choose Download and open to open the file using the appropriate app on the PlayBook. Now, just like with the BlueBox app, when you make a change to a file, it is not automatically synced with Dropbox. You need to find the file on the PlayBook and then select it and upload it. NOTE: Finding the document once you make changes can be a bit of a challenge using Files and Folders. Usually, your document will be in the playbook:/accounts/1000/shared/downloads folder. 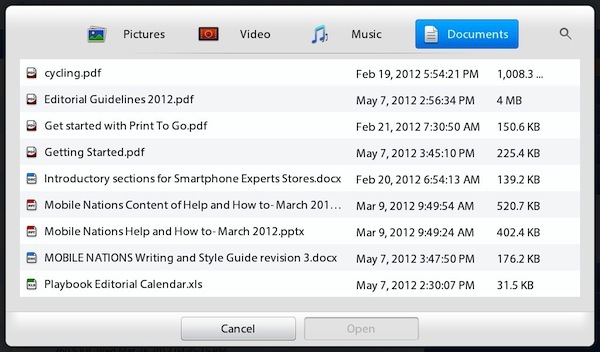 Files and Folders is free to Try $2.99 to buy and can be found here. 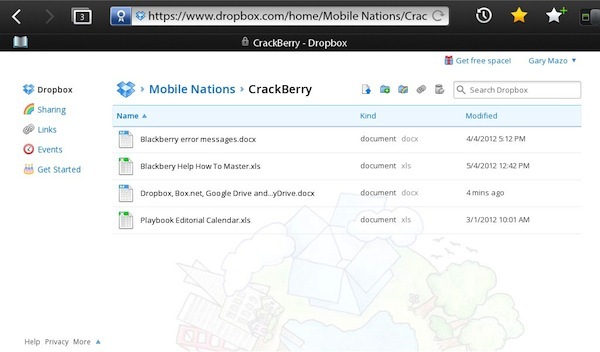 The last way to access your Dropbox account is with the very capable Browser app on the PlayBook. Just go to www.dropbox.com with your Browser and login into your account. Highlight the file you wish to look at/edit and then select Save in the next window. Touch the Download Complete notification or just pull down the menu and select Downloads and then select Open File. The corresponding app will then open on the PlayBook. To upload a file that has been edited, the procedure is very similar to what we did earlier. Just select Upload a file (then choose the basic uploader) and you will see all the documents on your PlayBook. Choose the file and it will be uploaded back to your Dropbox account. One of the great things about the Files and Folders app is that you can also use it with your Box.net, Google Drive and SugarSync accounts in exactly the same manner as you used it with your Dropbox account. Just pull down the menu, select the service to use and login. Box.net has its own dedicated app, which we will cover in a bit, but this is particularly useful for Google Drive. Google Drive is essentially your Google Docs in a new 5GB package. Log into your Google account through the Files and Folders app and you will see all your Google Docs. Select the document with which you wish to work and you have slightly different options along the left hand column; you can: Open online, Download and open as Word, Cut to clipboard, Move files to trash, Rename file, New folder, Zip to or Send as. What is very cool about this is that you can really "collaborate" on a Google Doc just like you would on your PC or Mac - all changes you make are reflected in the documents shared by all collaborators. I signed up for Box when they ran a promotion a few months back to download the iOS app and get 50GB of free storage. I signed up and backed up my entire documents folder for safe keeping. Then I read the fine print that only allows you to download files of up to 100 MB at a time from your "Free" account. That meant that I could not simply download full folders onto a new Mac - lesson learned. It is still very convenient for accessing one document at a time and hey, 50GB is 50GB! Box also has a dedicated app for the PlayBook, which I very much appreciate. Although you can certainly access your Box account through the Files and Folders app and use exactly the same method as detailed above, using the dedicated app is easier and has a much cleaner interface. Download the Box app from BlackBerry App World and then login to your Box account. Your folders will be listed under the Al Files tab to the left. 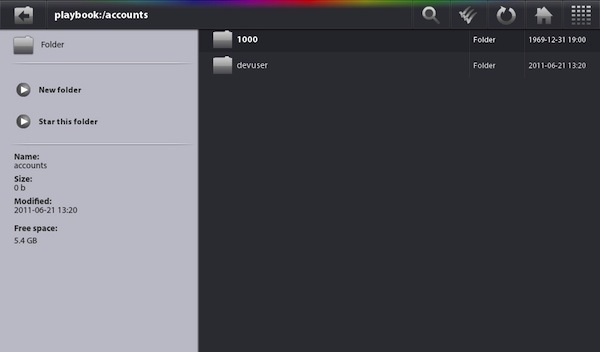 Touch a folder to see the contents - folders and files - and then open the selected file. Just like with the other apps, the appropriate app opens on the PlayBook. 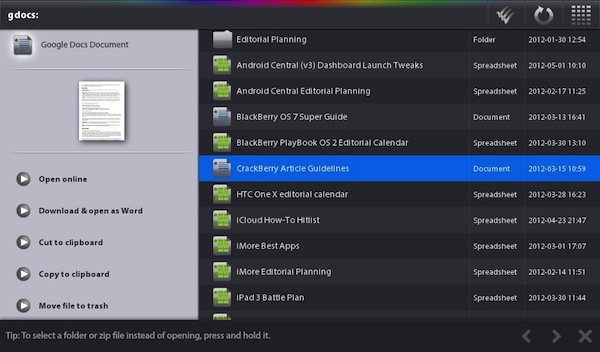 Just like with BlueBox and Files and Folders, this saves a local copy of the document to your PlayBook. To upload your changes you need to upload the document that is now on your PlayBook's drive. Touch the Upload arrow at the top left and highlight the document from your PlayBook. If you are in the Open File screen, you will see the option to Upload New Version that will overwrite the old version. You also have the option as soon as you start the Box app to upload a document. You can also upload images, music or video files, but beware - the free version of Box does limit the file size of what can subsequently be downloaded at a future date. The pull down menu in the Box app is fairly sparse; there are only options to Refresh, Logout or view a comprehensive Help menu. Box for PlayBook is free and can be found here. SkyDrive is Microsoft's answer to Dropbox. Windows Phone users and Windows Live users have a SkyDrive account (often with extra storage incentives) when their Phone or Xbox is activated and configured. Currently, SkyDrive is giving its users 7GB of free space. There is no dedicated app for SkyDrive for BlackBerry, but there are some third party apps that work with your SkyDrive account. For our purposes, the Browser based interface worked very well on the PlayBook. 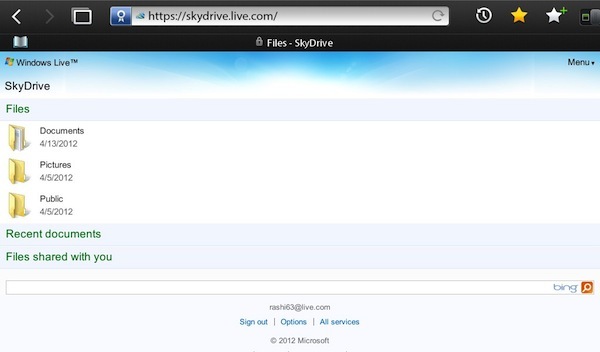 Just point the Browser to skydrive.live.com and login with your Windows Live ID. You then see a very familiar file structure - not dissimilar from the other cloud storage sites. By default, there are three folders; Documents, Pictures and Public. Simply touch the folder you wish to open, choose your document or image and it will open in the Browser window. You also have the option of downloading the document. For most situations, I found that downloading the document and then opening with one of the native apps on the PlayBook worked much better. The web-based interface was fine for downloading and reading documents or looking at images, but since there is no option to then upload a document from the PlayBook, this is not a great tool for true online collaboration. The good news is that you can, in fact, access pretty much any cloud storage solution from your PlayBook even without native apps. Dropbox has always been my "go to" service - it works seamlessly between all my computers and keeps my files in sync. While I do wish there was a native Dropbox app that supported true document syncing - both the BlueBox app and the Files and Folders app did a very good job and offered a wide array of choices for document management, downloading and uploading. Files and Folders also did a great job with Google Drive and Box. 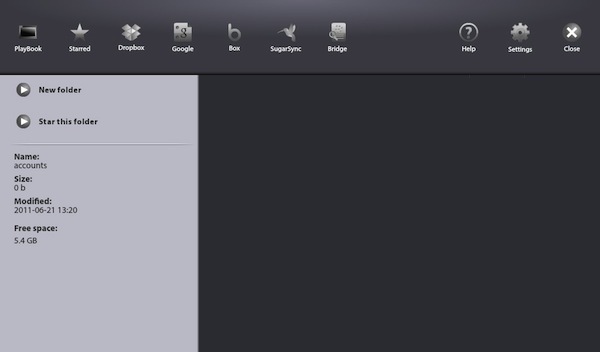 While I didn't test it out for SugarSync, I assume the functionality is quite similar to the other services. Box supports the PlayBook with a native app - and just for that reason I like to support them. The app works great and the storage options are fine for their free account - with the limitation on the size of file uploads and downloads being the only problem for me. Until SkyDrive puts out a native app, it is hard to recommend it - but if you happen to have a free SkyDrive account, know that you can at least access your files and read and download them from the PlayBook. All in all, things are looking good for PlayBook owners with regards to managing and working with all the major players in Cloud Storage. We can only hope that this will get even better with BlackBerry 10 and that we will get true developer apps for both Dropbox and SkyDrive. Which Cloud Storage service are you using with your PlayBook? Let us know in the forums.